Pianist Adam Gyorgy said he was impressed by the enthusiasm of the audience of Chengdu when he had a recital in the city on Saturday. "I didn't expect so many people here like the piano, love music, not only adults but also children. I was pleasantly surprised by the enthusiasm of the audience," said Adam Gyorgy, who gave a performance in Chengdu on October 27, celebrating the 165th anniversary of world's iconic piano maker Steinway & Sons. 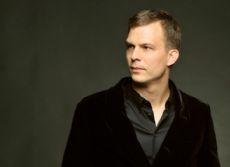 Adam Gyorgy, Hungarian virtuoso pianist and Steinway Artist, is recognized as one of the leading classical pianists in the world. His performance on Saturday began with La Campanella by Liszt, and Adam Gyorgy offered a playful rendition, elegantly highlighting the melody that emerges from the filigree and runs. Talking about the impression of Chengdu and Sichuan, the pianist said he was most impressed by the food and the enthusiastic audience of the city: "There are many varieties of delicious food in Chengdu, and I like it so much!" "Music is a very abstract language that goes straight to the heart, but it's also a language that has no borders. People share common feelings and expressions of emotion," he added, "The performance in Chengdu made me feel relaxed and at ease." Adam Gyorgy said that he hoped to come to Chengdu again to meet with the audience and piano lovers: "I have the obligation to present high-quality music to the audience, and I have the confidence to make more audiences and children fall in love with music."